Talking about cocky play, who are the teams that should be bullish about their chances? Who are the teams you’re expecting to do well? It’s hard to say because the meta’s changed, so that’s going to affect teams in a big way. British Hurricane won the Overwatch Contenders EU Final and they won the showmatch in Season One. I think they’ll be just as strong. They are the London Spitfire academy team, so I think they are going to come in strong. They’ll have done a lot of prep. 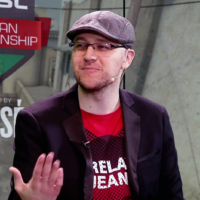 What was quite exciting for me was that on LAN we got to see Angry Titans play well. It will be quite fun to watch them and see what they can do. I’m excited to see a lot of the new teams as well. Overwatch Contenders is always fun because you get to see a bunch of players and teams that are not really well-known, like Bazooka Puppies and Orgless And Hungry. They’re really just coming to get noticed. Those guys tend to pop off, which makes it really entertaining and surprising sometimes. I really like the London Hurricane and Spitfire naming convention. They’ve got a bit of a Battle of Britain thing going on. Do you think some of those players from the academy side could make the step up to Overwatch League? Is stepping up to Spitfire the intention? I don’t know if they’d necessarily go to Spitfire, but I definitely think those players will be bought by Overwatch League teams. In Season One, we saw two players picked up OWL. I do think players from Hurricane could make the jump to OWL at some point. That’s the whole point of Contenders, really. The players are competing to get noticed by OWL teams, which makes it quite fun. Outside of London Hurricane, are there players that you’d say viewers should keep an eye on when they tune in for the broadcasts? I have a really different opinion to the rest of the broadcast team on this. I like players that come out and show off. The ones that are really fun and grab the crowd. The rest of the panel looks at the more clinical side of who plays well every week. My favourites from last season: One of them was a player called Shax. He plays DPS and is really, really impressive. He was from Orgless And Hungry (now with Mayhem Academy) and predominantly played on Tracer. The other player is naGGa. He plays for Copenhagen Flame and is a very young guy. I really like his attitude. He’s super down to earth and sincere, which is always nice. I’m a big fan of his. Again, he plays DPS. I think this is always the problem with Overwatch: it’s that the DPS players tend to stand out more than anyone else because they do those aggressive plays. I’m also a huge fan of a team called CIS Hope. We’ve seen them play at LAN. They are these Russian kids and I just think they’re so cool. They are a bunch of mates and are really good. They do some strange and interesting things with the way they play their heroes. There’s also Bazooka Puppies. I just like them because I think their name is cool, but also because they caused the biggest upset in season one. There’s lots of new guys to follow. That’s what makes Overwatch Contenders fun because you never know who is going to rise up and be that player that you end up saying “where did they come?”. 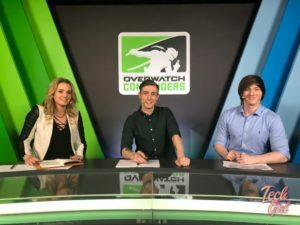 It looked like you had a lot of fun working with your fellow broadcast talent on Overwatch Contenders Season One. Was it great to work with them? We had to live together for five weeks, so we had no choice but to get on well. The four guys were from the UK, I’m from South Africa. We were all based in the Ukraine for five weeks. I think that it makes you close automatically when you live with people. Living with people is completely different to working with people, so you see a different side of them. I’ve always worked with cool people, but you hear lots of stories about broadcasts where everyone is trying to be a superstar. They forget that our only job is to make the players superstars. Not so here. We were all really passionate about putting on the best possible show and to showcase the players as best we could. That makes it really cool when everyone is on the same page. Everyone was kind of amped to help everyone else. From an Overwatch point of view, I didn’t have a lot of experience with the game. We don’t even have servers in South Africa. I was nervous coming in, but the guys that did have experience jumped in and helped me. When it came to the broadcast and on-camera side, I have quite a bit of experience from Gamescom, China and working in South Africa. I tried to help the guys who’d never been on a desk before. Everyone came to the party with their own strengths to help one another. We all realized that you’re only as good as the weakest link, so you’ve got to make sure everyone is strong. 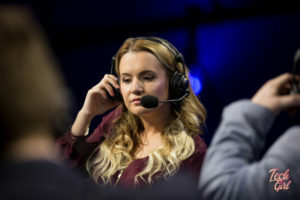 You’ve mostly worked on CS:GO broadcasts, so you’ve got a lot of experience covering it as a host and as an interviewer. Overwatch is a very different game. Was it a lot harder to learn, compared to Counter-Strike? Yes, because there’s so many heroes and so many abilities and there’s different ways that they can be played. I found learning Overwatch harder also because it’s so much faster than CS:GO. When a battle happens, you’re trying to listen to the casters because they can obviously see things you can’t. You’re trying to see what’s happening but there’s a lot of bright colours and chaos going on. You’re not only looking at what all the heroes do, but what they do together on different maps. It was difficult, but then again I was in a different country for five weeks, so I think I leveled up faster because that was my only focus. I still have a ton to learn. Also, now that I feel like I mastered it, they changed the meta. So there’s that. As a spectator, Overwatch is quite chaotic, which can make it hard to watch. As a broadcaster, does that make it quite difficult to bring the story across because of its chaotic nature? Not really. I think it’s harder for casters and I have mad respect for those guys. It’s really easy to just jump into shouting about what you’re seeing on the screen right now because there’s so much chaos happening. Being able to understand and interpret what all that super fast action means and being able to explain the dynamic is really impressive. Thanks for the chat Sam! Catch Overwatch Contenders EU every Monday and Tuesday night here. Header image courtesy of TechGirlZA Twitter.